During their turn, players may roll the dice as long as they wish -provided that they can place or move at least one of the runners. If, after rolling the dice, a player is unable to move, his turn ends immediately and he loses everything that he achieved during that turn. He should have stopped in time… but he didn't! 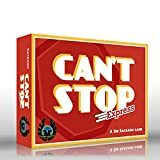 Everybody likes to try just once more-and then maybe once more… they CAN'T STOP! CAN YOU? Advancing your cone to the uppermost square in a column, the one bearing the number, is the goal. Players try to be the first to occupy three top squares with their own cones and this win the game. 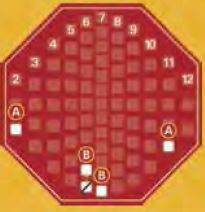 Place the game board in the center of the table. Each player chooses a color and places the 11 cones in front of them on the table. The board has 11 number columns, numbered from 2 to 12. The columns consist of a varying number of squares. The fewer squares a column has, the more difficult it is to roll this number, and vice versa. Each player choose a color and places the 11 corresponding cones in front of them on the table. The youngest player takes the 4 dice and 3 white cones (the runners). The youngest player starts, then play continues in clockwise order. The player whose turn it is always rolls all 4 dice at once. They must form two pairs of dice with the numbers that they have rolled. The sums of these two pairs determine the column(s) in which the player must introduce a runner. Anna places a runner on the bottom-most square of column 5 and another runner on the bottom-most square of column 9. Anna places a runner on the bottom-most square of column 6 and another runner on the bottom-most square of column 8. Anna places a runner on the bottom-most square of column 7 and then moves it one square upwards - that is in total 2 squares. If a player forms two dice pairs that allow her to introduce (or move) two runners, she must do so. (In Example 1, option A or B, Anna must introduce both runners). However, a player may deliberately form the two dice pairs so that she is able to introduce or move only one runner . (Example 1, option C). 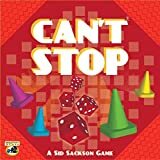 If a player has introduced at least one runner, she may choose to continue playing - that is, she rerolls all 4 dice and again forms two dice pairs. After doing so, she again introduces or moves one or two runners. Anna introduces the third runner on the bottom-most square either of column 2 or column 11 (A). In this case the other dice pair doesn't count. Anna introduces the third runner on the bottom-most square of column 7 and moves the runner in column 6 one square upwards (B). either stops voluntarily (Fig. 3). or is forced to stop because he cannot introduce or move any runner (Fig. 5). 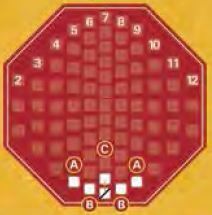 If a player stops voluntarily he places one of his own cones on each square that his runners have reached on the game board. A player always uses only one of his cones per column. If during a subsequent turn, the player introduces a runner in column in which he already has a cone, he places the runner on the square above the one occupied by his cone. If he stops voluntarily later this turn, he moves his previously-placed cone up the board to this new square to which the runner has advanced and replaces that runner with his cone. Note: Opponents' cones on the game board are no obstacle for Introducing or moving a runner or for placing one's own cone; if necessary, you simply stack up the cones (see Fig. 4). 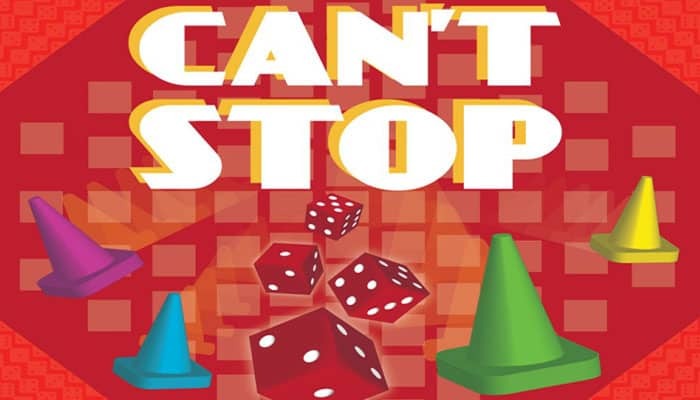 If a player is forced to stop, because be was not able to place or move a runner after rolling the dice, he loses everything that he has achieved during this turn and must remove the runners without any effect. In this case, this player neither places new cones on the board nor moves any of his previously-placed cones (see Fig. 5). Anna has chosen Option A on her first roll, Option A on her second roll and has established cones on 2, 5, and 9. She has decided not to continue with a third roll and stops as shown in Figure 3. Or Anna has successfully rerolled the dice several times and moved the runners from the X's shown in fig. 4. Now she stops voluntarily and moves her three cones onto the squares occupied by the runners. It doesn't matter if a square is already occupied by an opponent's cone, such as the yellow one in column 9, just stack the cones. Or if Anna did not stop voluntarily but instead rolled . Her turn would have ended and she would have had to remove the three runners from the game board without any consequence (shown in Figure 5). When Anna is finished, the next player lakes her turn. She takes the three runners and the four dice. She can turn the game board if she wishes so that she can read the numbers without any problem. If a player leaches the number square at the top of the column with a runner, he may continue to roll the dice or stop voluntarily. However, he should keep in mind that he cannot move this runner anymore - even if he rolls this number on the dice. (This increases a player's risk of being forced to stop and consequently losing this column). Thus, it's probably a very good idea to stop voluntarily. In this case the player places his cone directly on the number square .All of the other cones in this column are then returned to their owners. For the rest of the game, no player can place a runner in this column, including the player who has won this column. As long as a column has not been won. i.e. the number square at the top is not yet occupied by a cone, each player may try their luck at winning it - provided that they roll the required dice pairs. As soon as a player wins a third number square (claims the column) at the top of the board the game ends immediately. This player won the game.